What’s brilliant but filled with rubbish? My job . . .
I’ve been lucky enough to experience a range of different and interesting jobs since I joined the Environment Agency in 1998, but I feel most proud of the work that I’m doing at the moment. That’s because I’m currently helping reduce the risk of pollution from waste sites across Staffordshire, Warwickshire and West Midlands. We know from experience that high-risk waste sites not only harm the environment, but cause disruption and stress to the community, threaten legitimate business and can cost millions of pounds of damage too. 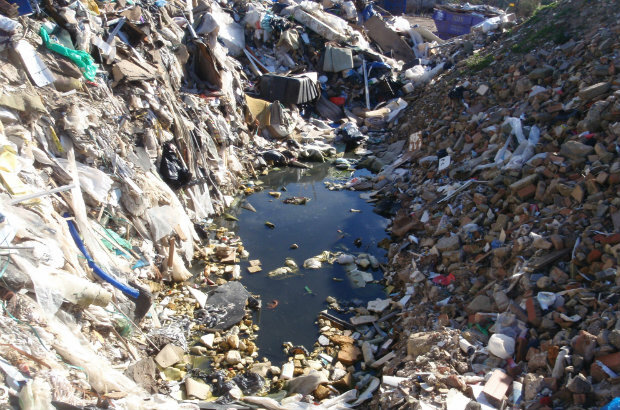 Poor compliance or illegal waste sites can cause damage to the environment. With our teams of dedicated environment officers and a plan of action, we’ve been busy tackling sites that pose the highest risk of polluting the environment and nearby communities. This year, we’ve already served notices to revoke permits on some of our highest fire risk waste sites – to permanently remove their permits and stop operations. And at other sites, we’ve suspended permits if they pose unacceptably high levels of pollution risk. We’ve recently worked with a plastics waste site in Stoke-on-Trent that was of real concern to us. The operator was storing large amounts of waste without an environmental permit and, despite requests, the company failed to remove it. We worked with partners, including the police and fire service, to immediately stop further waste being dumped and put emergency plans in place to reduce the fire risk. We also served a notice requiring the operator to remove the waste that was already there. They’ve already removed almost half of the waste that was on the site and are working to remove the rest by the September deadline. Helping to make sites safe and improve the environment makes a real difference to people’s lives; and that’s why my job is brilliant. Most businesses manage their waste responsibly and within the regulations. Unfortunately those who break these rules are putting communities at risk, damaging the environment and threatening legitimate business. It’s really rewarding to know that our approach in taking tougher action at these sites is helping to reduce the risk to people and the environment. If you think a site may be operating illegally, you can report it anonymously to Crimestoppers. Call 0800 555 111 or give information anonymously online. The job title "waste crime officer" sounds exciting in itself, but there's a growing concern for waste sites across the UK. More than a few companies have failed to take responsibility for waste sites under their supervision. There was a huge scandal a few months back concerning recycling firms that went bankrupt and abandoned their property with tonnes of rubbish still sitting there (http://www.environmental-expert.com/articles/uk-bankrupt-recycling-firms-leave-giant-waste-piles-with-million-pounds-in-collection-expenses-648594) . Naturally, the sites soon started blighting nearby communities and when the matter came to the attention of the authorities, all it meant was that millions of pounds would be needed for the rubbish removal.